As the granddaughter of a local potato farmer in Peterborough, Ontario, Leigh learned at an early age that one has to “dig deep to get to the root where success begins”. With almost thirty years of experience in a multi-dentist practice, and as a well-respected dental practice consultant and coach for over the last ten years, Leigh knows dentistry inside-out. She has combined this principle to “dig deep for success” with her passion for the dental industry to inspire permanent change within the practice. Her program is designed to help every team member learn the integrative thinking and inquiring skills necessary to successfully guide the practice together towards the development and implementation of measurable, consistent, and more profitable results. Leigh has expanded her Treatment Coordinator Training program to implement other proven business management protocols and processes for dentistry. Her Case Acceptance Program dramatically improves team efficiency and productivity, while concurrently increasing patient case acceptance. The net result? The acceleration and achievement of dental practice financial goals, and, as important, higher team morale. Whether she is conducting a practice assessment, training a group, or coaching an individual team member, Leigh brings inspiration, high energy, boundless enthusiasm, and a wonderful sense of humor that can’t help but ignite high team performance and the achievement of better financial results. As a graduate from the School of Business, Durham College, Cathy provides the administrative support necessary to Leigh and the rest of the Talkin’ Teeth team. She is the mortar between the bricks. 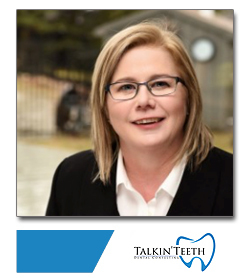 Cathy has been a major contributor towards the development of Talkin’ Teeth’s excellent organizational and communication teaching modules. These modules provide the team with the fundamental tools they need to inspire dental offices, moving them forward towards continuous and measurable improvement. 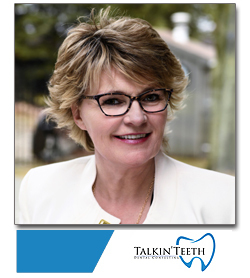 Cathy believes Talkin’ Teeth’s Innovative teaching and thinking approaches are the foundation, the essential blocks, towards helping the dental profession achieve the highest standards of dental care. In her spare time, Cathy likes staying active and particularly enjoys cycling, hockey and yoga. 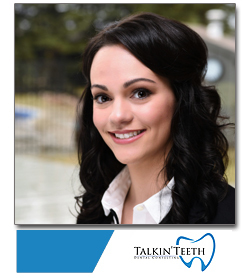 Danielle graduated from Durham College in 2007 with an honours certificate in Dental Administration. She excelled in dental marketing, dental office management and practice accounting principles, dental office emergency protocol, as well as having had thorough training with respect to oral health conditions and general physiology. Danielle served as a volunteer representative on the board of Health Sciences at Durham College for four years after graduation. Danielle has had a highly successful career as a treatment coordinator for more than a decade, and has had first-hand experience with almost all aspects of general dentistry. Her passion to learn more about and stay at the forefront of this fast-changing profession brought her to the coaching side of dental consulting last year. Danielle's enthusiasm and outgoing attitude is contagious. 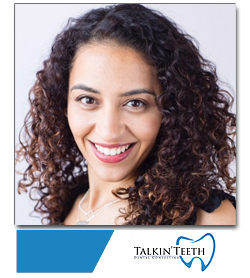 Her natural warmth and empathy for the dental team make her one of Talkin’Teeth’s most sought-after trainers. She is always excited to share her expertise and insights with practice team members who eagerly soak-up her knowledge and apply it in the practice before her next visit. She evokes great enthusiasm from the team, and gets great results. She is proficient in both AbelDent and Cleardent, and is very comfortable with other dental office software. Danielle is certified in Ontario’s Health and Safety legislation, and has an encyclopedic knowledge of dental workplace compliance standards and compulsory legislation including: health and safety, violence and harassment, infection and prevention control, WHMIS and Safety Data Sheets, Accessibility for Ontarians with Disabilities, and more. Danielle attends pertinent dental courses throughout the year to help her teach at peak performance. Nora has been in the in dental profession for over 15 years. Her professional experience includes dental assisting, dental hygiene, orthodontics, practice efficiency consulting, and most importantly, complete oral health management. In other words, Nora teaches it all. She graduated from Niagara College’s Dental Hygiene Program in 2004, and completed the University of British Columbia’s Bachelor Degree in Dental Science in 2010. Nora is an avid follower of current dental science research and always looks to bring her clients new technologies and techniques that deliver the most suitable training for their needs. Nora believes oral health care is a highly personal matter, and being an integral part of the body, must be professionally monitored and maintained if a person wishes to achieve optimal general health. With this holistic approach in mind, patient education and communication are essential parts of Nora’s dental team training. Her deep knowledge of and passion for dental health care, her use of smart clinical efficiencies which incorporate easy practice-management skills and systems, in combination with her natural entrepreneurial spirit, have helped Nora develop tailored strategies for team development that empower bringing impactful patient-centred care. Nora will help bring your practice to a new level.